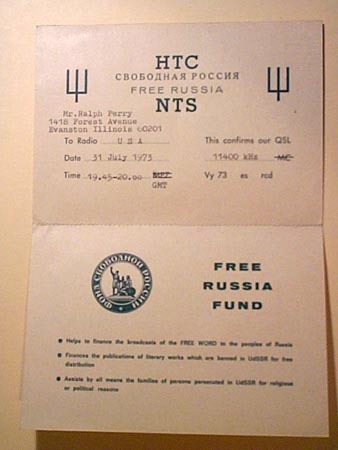 Radio Free Russia was run by NTS (Popular Labor Union) --Russian oppositional anti-Communist organization actively supported by CIA. 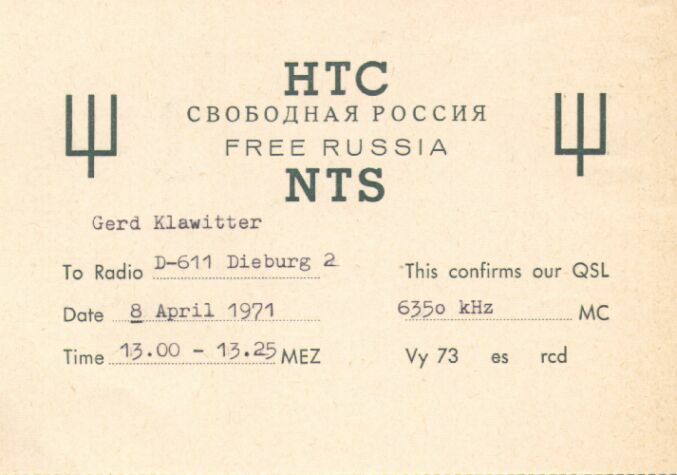 Located in Frankfurt, NTS advocated the violent overthrow of the Soviet regime. CIA's funding of NTS stopped only in 1989. Of course, in the 70s CIA's connection was still denied. NTS is famous for publishing books written by the " unpublishable " Soviet authors and smuggled out of the USSR. 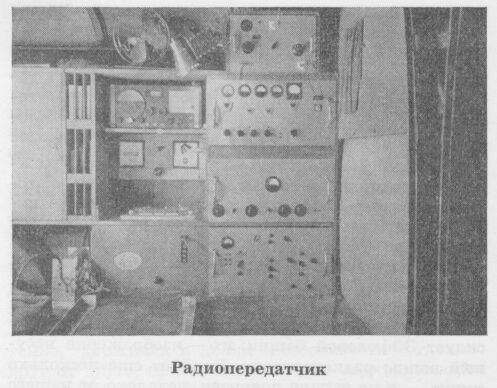 Not much is known about NTS's highly secretive station Radio Free Russia. It began broadcasting sometime in the 50s and was on the air through the mid 70s. It was a clandestine operation run out of West Germany. At some point, it had relays from South Korea and perhaps Taiwan. 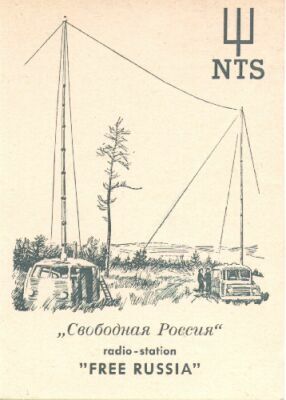 German " Free Russia " used txs of 10 kW. It was jammed so heavily that I doubt it had any audience in the Soviet Union. 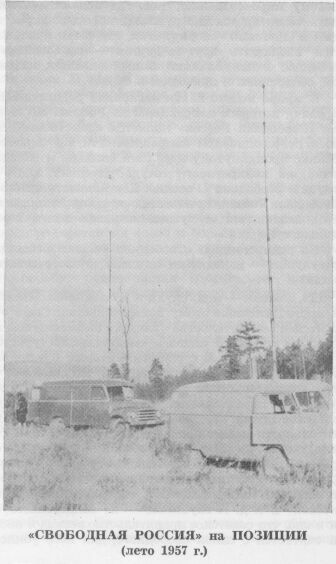 RFR was also known for using the Russian military frequencies to reach the Soviet forces in East Germany. The station was shut down by West-German authorities when their " real politik " began (diplomatic recognition of GDR, better relation with USSR, etc.). These days, one can hear a station with a similar name broadcasting on several AM-frequencies out of Moscow. Ironically, contemporary " Free Russia " is run by the Communists. It is an officially registered operation opposing the Kremlin authorities. I guess people behind this " Free Russia "; would not mind some kind of violent revolution, either. Subject : Re : once more - thank you ! 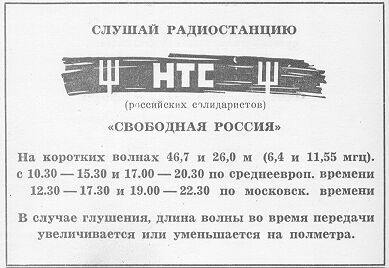 (summer 1958). 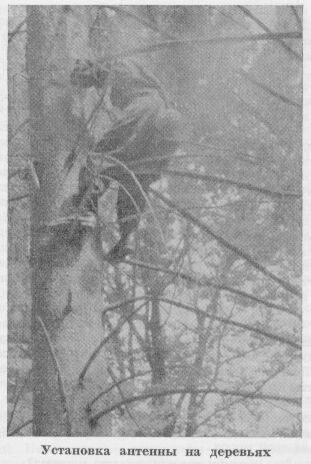 The attack was alledgly conducted by the Soviet intelligence. 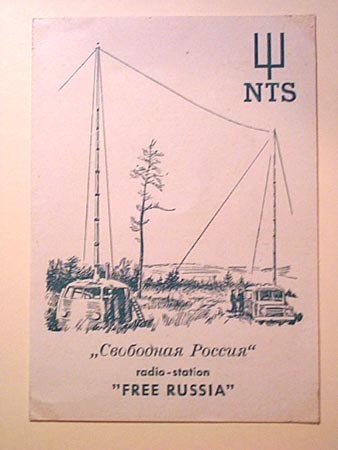 Listen to Radio Station NTS (of Russian Solidarists) " Free Russia " ! [We are] on the short waves 46.7 and 26.0 meters (6.4 and 11.55 MHz) 10 : 30-15 : 30 and 17 : 00-20 : 30 Central European Time, 12 : 30-17 : 30 and 19 : 00-22 : 30 Moscow Time. In case of jamming our radio transmitting wave length extends or shortens by half a meter. 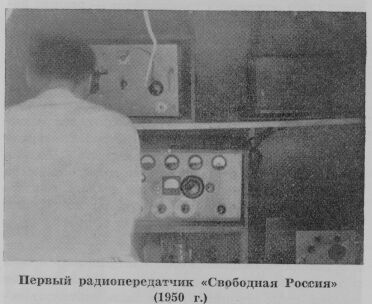 All six pictures are taken from the uncopyrated Russian-language booklet of NTS titled " Radio Free Russia : The Revolutionary Message on the Air " presumably published in West Germany in 1958.